There was a cooking competition at Chicago’s O’Hare Airport a while back and one of the prizes was having the winning dish featured on the menu at one of the HMS Host restaurants in the airport. 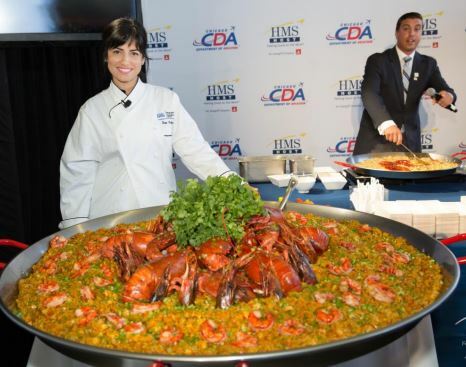 That dish is now ready – so next time you pass through ORD,you can stop by Goose Island Brewery and order the Paella Bowl, based on the winning recipe Sepi Naficy whipped up for the 2016 Channel Your Inner Chef contest. Your plate won’t be as big as the one in the picture above, which was used to give travelers passing through ORD last week a taste, but it will have grilled chicken and shrimp with spring peas served over chorizo-infused rice.